Galaxies can be remarkably dusty places  and supernovae are thought to be a primary source of that dust, especially in the early Universe. But direct evidence of a supernova's dust‐making capabilities has been slim up to now, and could not account for the copious amount of dust detected in young, distant galaxies. But now observations with ALMA are changing that. 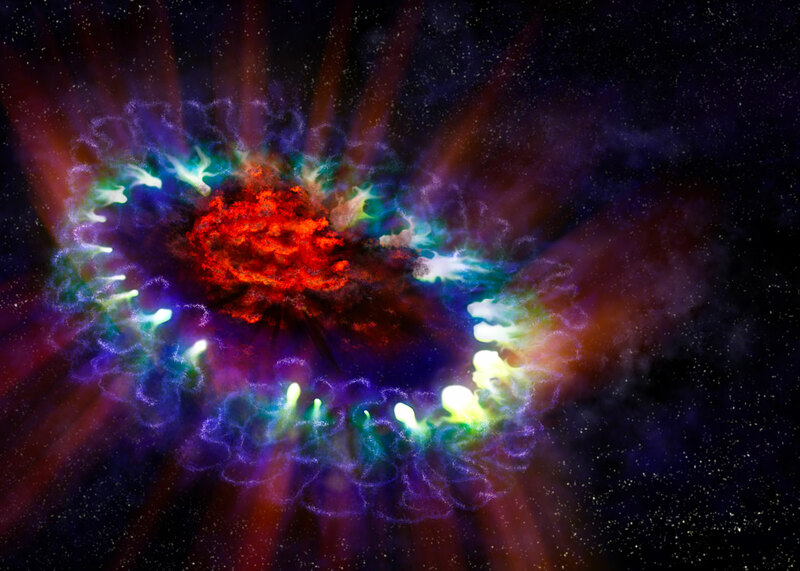 "We have found a remarkably large dust mass concentrated in the central part of the ejecta from a relatively young and nearby supernova," said Remy Indebetouw, an astronomer at the National Radio Astronomy Observatory (NRAO) and the University of Virginia, both in Charlottesville, USA. "This is the first time we've been able to really image where the dust has formed, which is important in understanding the evolution of galaxies." 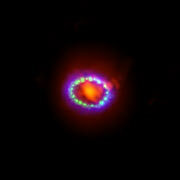 An international team of astronomers used ALMA to observe the glowing remains of Supernova 1987A , which is in the Large Magellanic Cloud, a dwarf galaxy orbiting the Milky Way about 160 000 light‐years from Earth. SN 1987A is the closest observed supernova explosion since Johannes Kepler's observation of a supernova inside the Milky Way in 1604. With ALMA's unprecedented resolution and sensitivity, the research team was able to image the far more abundant cold dust, which glows brightly in millimetre and submillimetre light. The astronomers estimate that the remnant now contains about 25 percent the mass of the Sun in newly formed dust. They also found that significant amounts of carbon monoxide and silicon monoxide have formed. "SN 1987A is a special place since it hasn't mixed with the surrounding environment, so what we see there was made there," said Indebetouw. "The new ALMA results, which are the first of their kind, reveal a supernova remnant chock full of material that simply did not exist a few decades ago." The site of the supernova is surrounded by bright glowing rings of material that were seen in earlier observations with the NASA/ESA Hubble Space Telescope. These were initially lit up by the ultraviolet flash from the original explosion, but over the past few years the ring material has brightened considerably as it collides with the expanding shockwave. After hitting this envelope of gas, which was sloughed off by the progenitor star as it neared the end of its life, a portion of this powerful explosion rebounded back towards the centre of the remnant. "At some point, this rebound shockwave will slam into these billowing clumps of freshly minted dust," said Indebetouw. "It's likely that some fraction of the dust will be blasted apart at that point. It's hard to predict exactly how much — maybe only a little, possibly a half or two thirds." If a good fraction survives and makes it into interstellar space, it could account for the copious dust astronomers detect in the early Universe. "Really early galaxies are incredibly dusty and this dust plays a major role in the evolution of galaxies," said Mikako Matsuura of University College London, UK. "Today we know dust can be created in several ways, but in the early Universe most of it must have come from supernovae. We finally have direct evidence to support that theory." 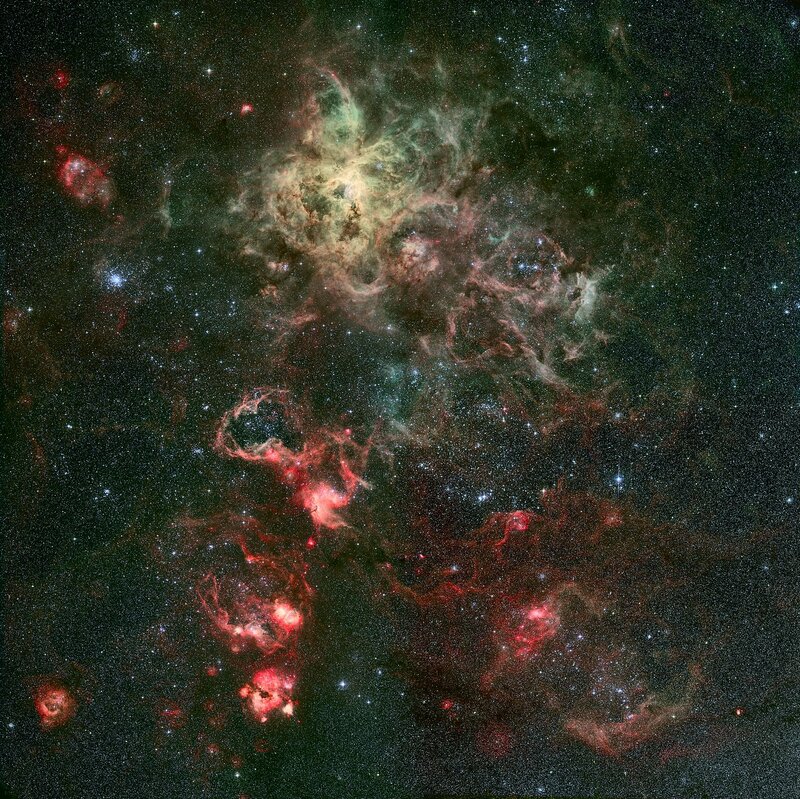 Light from this supernova arrived at Earth in 1987, as is reflected in the name. This research was presented in a paper “Dust Production and Particle Acceleration in Supernova 1987A Revealed with ALMA”, by R. Indebetouw et al., to appear in the Astrophysical Journal Letters. The team is composed of R. Indebetouw (National Radio Astronomy Observatory (NRAO); University of Virginia, Charlottesville, USA), M. Matsuura (University College London, United Kingdom [UCL]), E. Dwek (NASA Goddard Space Flight Center, Greenbelt, USA), G. Zanardo (International Centre for Radio Astronomy Research, University of Western Australia, Crawley, Australia [ICRAR]), M.J. Barlow (UCL), M. Baes (Sterrenkundig Obst Gent, Gent, Belgium), P. Bouchet (CEA-Saclay, Gif-sur-Yvette, France), D.N. Burrows (The Pennsylvania State University, University Park, USA), R. Chevalier (University of Virginia, Charlottesville, USA), G.C. Clayton (Louisiana State University, Baton Rouge,USA), C. Fransson (Stockholm University, Sweden), B. Gaensler (Australian Research Council Centre of Excellence for All-sky Astrophysics [CAASTRO]; Sydney Institute for Astronomy, The University of Sydney, Australia), R. Kirshner (Harvard-Smithsonian Center for Astrophysics, Cambridge, USA), M.Lakicevic (Lennard-Jones Laboratories, Keele University, UK), K.S. Long (Space Telescope Science Institute, Baltimore, USA [STScI]), P. Lundqvist (Stockholm University, Sweden), I. Martí-Vidal (Chalmers University of Technology, Onsala Space Observatory, Onsala, Sweden), J. Marcaide (Universidad de Valencia, Burjassot, Spain), R. McCray (University of Colorado at Boulder, USA), M. Meixner (STScI; The Johns Hopkins University, Baltimore, USA), C.-Y. Ng (The University of Hong Kong, Hong Kong), S. Park (University of Texas at Arlington, Arlington, USA), G. Sonneborn (STScI), L. Staveley-Smith (ICRAR; CAASTRO), C. Vlahakis (Joint ALMA Observatory/European Southern Observatory, Santiago, Chile) and J. van Loon (Lennard-Jones Laboratories, Keele University, UK). ESO is the foremost intergovernmental astronomy organisation in Europe and the world’s most productive ground-based astronomical observatory by far. It is supported by 15 countries: Austria, Belgium, Brazil, the Czech Republic, Denmark, France, Finland, Germany, Italy, the Netherlands, Portugal, Spain, Sweden, Switzerland and the United Kingdom. ESO carries out an ambitious programme focused on the design, construction and operation of powerful ground-based observing facilities enabling astronomers to make important scientific discoveries. ESO also plays a leading role in promoting and organising cooperation in astronomical research. ESO operates three unique world-class observing sites in Chile: La Silla, Paranal and Chajnantor. At Paranal, ESO operates the Very Large Telescope, the world’s most advanced visible-light astronomical observatory and two survey telescopes. VISTA works in the infrared and is the world’s largest survey telescope and the VLT Survey Telescope is the largest telescope designed to exclusively survey the skies in visible light. ESO is the European partner of a revolutionary astronomical telescope ALMA, the largest astronomical project in existence. ESO is currently planning the 39-metre European Extremely Large optical/near-infrared Telescope, the E-ELT, which will become "the world’s biggest eye on the sky".